5:20AM wake up call! Luckily, our taxi driver Adama was ready and waiting for us outside of The Sleeping Camel. Today, we’d head out to the ancient town of Djenne, Mali. By buying our tickets the night before with Afrique Express, we were able to secure seats as it’s first-come, first-serve. Finally, at 7AM, the bus was ready to go! The ride was long, but we luckily received a break at the city of Segou at 11:30AM. As I was buying a pen for my journal, the bus took off (i.e. it sped away with me chasing it!). I looked around and did not see any of my travel mates. Luckily, the few Malians that spoke French told me that the bus would come back after filling up with gas. After a few minutes, I was thankful that Lindsey showed up as I was the only one with a cell phone. Everyone said that the bus would come back, so we just relaxed and ate meat-on-a-stick. Soooo…two hours later we were still missing the bus, our luggage, and our third travel-mate. C’est la vie. At arrival at Carrefour Djenne, we were a bit nervous being the only ones out of a bus of 50+ to descend. It was the middle-of-nowhere. So…we waited for something, anything to come. Car, bus, horse, donkey, etc. Luckily, after about twenty minutes, a taxi stated that he was going our way for 1.500CFA each and we would just need to pay the 1.000CFA tourist tax. We called our PCV buddy, Jeremy Coats, who lives in Mali and in reality, yes, the tourist tax is legal! While on the ferry to cross the Bani River, I soon noticed that the man sitting next to me (or rather, the man who I was sharing the front seat with) had an Ithica New York College t-shirt. First-world clothing is often donated to the third-world, but apparently, this self-described nomad spent three weeks in NYC doing a slideshow (I later learned that he meant PowerPoint presentation at a tourism conference). In Djenne, once everyone found out that we were PCVs, they wanted to take us to “Sophie’s house.” Sophie, whoever you are and wherever you are, you were very well-integrated PCV in your community! After dinner at Chez Baba, the night was spent sweating and sleeping in the humid and hot sub-Saharan weather! Sheesh! First stop this morning was to acquire our visa extensions, so we wouldn’t be deported. Though the friendly airport officer told us immigration would be open today, the office was definitely not. Luckily, I had asked for the man’s number and he told us we could get them extended in Mopti, one of the legs of our trip. Mali is one of the poorest countries in the world, but looking at Bamako’s infrastructure, one would never guess that. With a population of almost 2 million people, Bamako is regarded as the fastest growing city in Africa. Investment has poured into the city so much as that there are multi-lane and elevated highways! Crazy. Being the shoppers that we are, we went straight to the Grand Marche and Artisanal. At the Artisanal de Sculptes, boutiques after boutiques of wonderful sculptures and artwork abound. There, I bought what later would become my favorite souvenir: a wooden pineapple (yes, I know that sounds like a lame souvenir, but I love it). Adorable kid? Good photo? I think so. I thought that this sweet woman in front of the Grande Mosquee was selling these bracelets at 500CFA ($1US). She was actually selling them for 50CFA ($.10US). We had to buy. Unfortunately, rain came in the afternoon, so we weren’t able to make the afternoon trip to Sibi (maybe I have a reason to go back to Mali! ), so we waited a bit at our hostel, The Sleeping Camel. Lindsey’s ATM card finally worked after yesterday’s fiasco and we headed off to Route Blah Blah in Hippodrome, a lively street full of restaurants, bars, and yes, a bowling alley inside a nightclub. It was good to start the trip in such a lively city with so much art. Tomorrow: the ancient town of Djenne! First let it be said that the Addis Ababa Bole International Airport is beautiful and large though it only has 11 gates. Lots of great shopping, clean, and best part of all: we got two passport stamps for our one-day entry and exit! Travelers and our passport stamps – we go hand in hand. 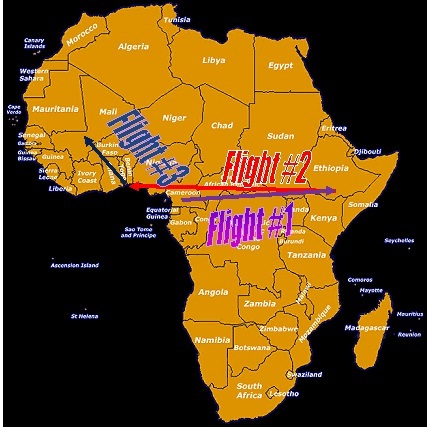 Yes, we started in Cameroon, flew east to Ethiopia, then west to Togo, and then North to Mali! At Bamako, we bought our visas hassle-free for $40US each. All we would need to do would be to get them renewed as the airport only issues 5-day visas. Making sure that the extension visa would not cost anything more, I also took the man’s phone number in case we ran into trouble later on. Note: When traveling in West Africa (or any country for that matter! ), always, always, take down the phone number of the legitimate government worker/nice person that helps you. It will save you hassles later on (and you’ll see why when I blog about trying to get the visa extension!). Right outside the Bamako's airport entrance was an Ecobank (same bank in Cameroon that Liz has and accepts Visa cards) and an Orange phone store (so we could buy our SIM card). Things felt too easy…and then the ATM ate Lindsey’s debit card. Note: If the ATM does not accept your card after two tries, do NOT try again! Pre-Traveling West Africa - I Just Want to Board the Plane! After a year of serving as Peace Corps Volunteers, Lindsey Dattels, Liz Adamo, and I decided to spend Ramadan discovering the rest of West Africa. Who knew finding more adventure was even possible? The next few posts will tell stories and show beautiful pictures from our trek across Mali, Burkina Faso, Togo, and Benin, but for now, let’s describe the journey (i.e. challenge) that it took for us to get there. At Douala International Airport, we checked in without problems, but Lindsey was later stopped for carrying a 9kg bag. Though it fit within the carry-on bag size, the baggage man stated there was a 7kg limit. We stated that we already checked with the front desk and there was no problem to which he stated that there was. The second we replied that we would talk to the main Ethiopian Airlines office, he let us go and said that we were being too stubborn. We win. Security went surprisingly well (which it never does for me), but right before the boarding gate, Lindsey was stopped again for her bag. We went through the same speech, but then I was stopped for having an over-sized contact lens solution bottle. “Do you have an ordinance for this?” “Yes, I do!” showing my prepared note with my own personalized stamp. We win again. After we sat down, another man came by to check our boarding passes and passports. Normal procedure…or so we thought. “We will buy the visa at Mali’s airport as there is no consulate in Cameroon,” I easily replied. “Only direct flights require visas and we have to transfer in Ethiopia first, so it’s an indirect flight.” (Special shout-out to Travelindependent. You saved our life with that one!). He continued to say he could not let us board; we continued to say that we could. Well, no need to explain that though we were nice, you could see the anger growing in his eyes and we were sent us to the main Ethiopian Airlines office. Interestingly enough, he wouldn’t give us his name. And so we retraced our steps and passed by EVERYBODY that stopped us before. I explained the entire situation to Mr. Essaya, but he couldn’t understand my Americanized-French accent. I explained again in English, but he only spoke Cameroonian-accented English. Fail. Luckily, Lindsey explained everything. Again, he asked us if we had a “pre-arranged visa.” “We’ll buy it at the airport.” He laughed in our faces. “We have already registered with the US Embassy. They know we’re coming.” You can always count on the US Embassy! After he made a phone call (which took what seemed like a lifetime), he simply hung up and said that we could board the plane. CHAMPIONSHIP WIN! After all the back-and-forth, Ethiopian Airlines put us up in the swanky four-star Panarama Hotel where we spent the night’s layover in Addis Abba. Hot shower, air-conditioning, all-you-can-eat buffet, and free internet. Definitely some things PCVs lack in our lives and can appreciate! Don't tell us that we don't know how to pack light for three weeks! Every good trip begins with a pedicure!